Hair Extensions are 100 % real hair come in a variety of colors. Extensions can be flat ironed, curled,and basically treated as your own hair. People will not be able to tell you have extensions. If you have a short cut or thinning hair, and always dreamed of long beautiful hair, call for a free consultation today! 100% human hair is being used by salons and stylists all over the world for its ability to maintain a radiant and smooth texture without using synthetic coatings like silicone. Equally important to stylists is the attachment method. 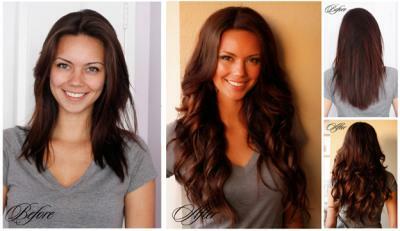 Extensions are available in 25 colors and can be curled, flat-ironed, washed, conditioned, and even colored. From adding highlights to volume to length, all looks and styles for all walks of life can be accomplished by hair extensions.